The PanDA workload management system developed at Brookhaven Lab and the University of Texas, Arlington, has been integrated on the Titan supercomputer at the Oak Ridge Leadership Computing Facility at Oak Ridge National Laboratory. With the successful restart of the Large Hadron Collider (LHC), now operating at nearly twice its former collision energy, comes an enormous increase in the volume of data physicists must sift through to search for new discoveries. Thanks to planning and a pilot project funded by the offices of Advanced Scientific Computing Research and High-Energy Physics within the Department of Energy’s Office of Science, a remarkable data-management tool developed by physicists at DOE’s Brookhaven National Laboratory and the University of Texas at Arlington is evolving to meet the big-data challenge. The workload management system, known as PanDA (for Production and Distributed Analysis), was designed by high-energy physicists to handle data analysis jobs for the LHC’s ATLAS collaboration. During the LHC’s first run, from 2010 to 2013, PanDA made ATLAS data available for analysis by 3000 scientists around the world using the LHC’s global grid of networked computing resources. The latest rendition, known as Big PanDA, schedules jobs opportunistically on Titan—the world’s most powerful supercomputer for open scientific research, located at the Oak Ridge Leadership Computing Facility (OLCF), a DOE Office of Science User Facility at Oak Ridge National Laboratory—in a manner that does not conflict with Titan’s ability to schedule its traditional, very large, leadership-class computing jobs. This integration of the workload management system on Titan—the first large-scale use of leadership class supercomputing facilities fully integrated with PanDA to assist in the analysis of experimental high-energy physics data—will have immediate benefits for ATLAS. “Titan is ready to help with new discoveries at the LHC,” said Brookhaven physicist Alexei Klimentov, a leader on the development of Big PanDA. The workload management system will likely also help meet big data challenges in many areas of science by maximizing the use of limited supercomputing resources. “As a DOE leadership computing facility, OLCF was designed to tackle large complex computing problems that cannot be readily performed using smaller facilities—things like modeling climate and nuclear fusion,” said Jack Wells, Director of Science for the National Center for Computational Science at ORNL. OLCF prioritizes the scheduling of these leadership jobs, which can take up 20, 60, or even greater than 90 percent of Titan’s computational resources. One goal is to make the most of the available running time and get as close to 100 percent utilization of the system as possible. A workload-management system like PanDA could help fill those spaces with other types of jobs as well. 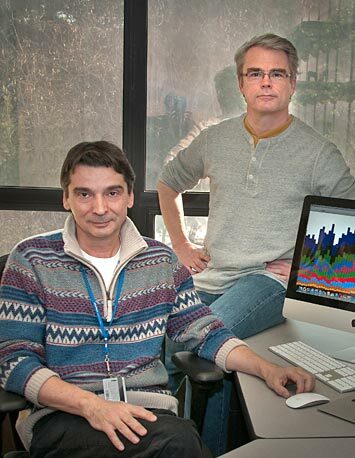 Brookhaven physicists Alexei Klimentov and Torre Wenaus have helped to design computational strategies for handling a torrent of data from the ATLAS experiment at the LHC. While supercomputers have been absolutely essential for the complex calculations of theoretical physics, distributed grid resources have been the workhorses for analyzing experimental high-energy physics data. PanDA, as designed by Kaushik De, a professor of physics at UT, Arlington, and Torre Wenaus of Brookhaven Lab, helped to integrate these worldwide computing centers by introducing common workflow protocols and access to the entire ATLAS data set. 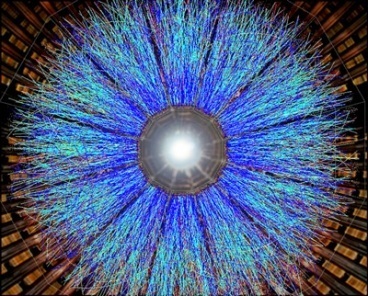 But as the volume of data increases with the LHC collision energy, so does the need for running simulations that help scientists interpret their experimental results, Klimentov said. These simulations are perfectly suited for running on supercomputers, and Big PanDA makes it possible to do so without eating up valuable computing time. The cutting-edge prototype Big PanDA software, which has been significantly modified from its original design, “backfills” simulations of the collisions taking place at the LHC into spaces between typically large supercomputing jobs. “We can insert jobs at just the right time and in just the right size chunks so they can run without competing in any way with the mission leadership jobs, making use of computing power that would otherwise sit idle,” Wells said. In early June, as the LHC ramped up to 13 trillion electron volts of energy per proton, Titan ramped up to 10,000 core processing units (CPUs) simultaneously calculating LHC collisions, and has tested scalability successfully up to 90,000 concurrent cores. “These simulations provide a clear path to understanding the complex physical phenomena recorded by the ATLAS detector,” Klimentov said. “This is a great achievement of the pilot program,” said De of UT Arlington, co-leader of the Big PanDA project. “We’ll be able to reach far greater heights when the pilot matures into daily operations at Titan in the next phase of this project,” he added. The Big PanDA team is now ready to bring its expertise to advancing the use of supercomputers for fields beyond high-energy physics. Already they have plans to use Big PanDA to help tackle the data challenges presented by the LHC’s nuclear physics research using the ALICE detector—a program that complements the exploration of quark-gluon plasma and the building blocks of visible matter at Brookhaven’s Relativistic Heavy Ion Collider (RHIC). But they see widespread applicability in other data-intensive fields, including molecular dynamics simulations and studies of genes and proteins in biology, the development of new energy technologies and materials design, and understanding global climate change. “Our goal is to work with Jack and our other colleagues at OLCF to develop Big PanDA as a general workload tool available to all users of Titan and other supercomputers to advance fundamental discovery and understanding in a broad range of scientific and engineering disciplines,” Klimentov said. Supercomputing groups in the Czech Republic, UK, and Switzerland have already been making inquiries. Brookhaven’s role in this work was supported by the DOE Office of Science. The Oak Ridge Leadership Computing Facility is supported by the DOE Office of Science. Brookhaven National Laboratory and Oak Ridge National Laboratory are supported by the Office of Science of the U.S. Department of Energy. The Office of Science is the single largest supporter of basic research in the physical sciences in the United States, and is working to address some of the most pressing challenges of our time. For more information, please visit science.energy.gov. While the United States was celebrating Independence Day two years ago, a group of people were cheering the discovery of something they had spent almost half a century seeking. Physicists around the world were convinced the so-called Higgs boson particle existed, but no one had found clear-cut evidence of it. At a well-attended press conference, scientists hailed the discovery, while recognizing the start of a new set of experiments and questions. As a part of the ATLAS team, Marc-Andre Pleier knew what the group was set to announce. He was very excited “to see the signal confirmed by an independent measurement.” Two years later, Pleier, a physicist at Brookhaven National Laboratory and a part of a group of more than 3,000 scientists from around the world, are tackling the next set of questions. 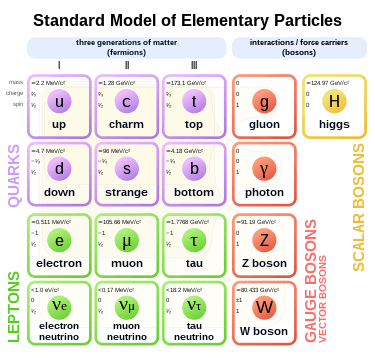 According to the Standard Model of particle physics, the Big Bang beginning to the universe should have created equal parts matter and antimatter. If it did, the two opposite energies would have annihilated each other into light. An imbalance, however, resulted in a small fraction of matter surviving, forming the visible universe. The origin of this imbalance, however, is unknown, Pleier said. “We know the Standard Models is incomplete,” he said, because there are observations of dark matter, dark energy and the antimatter/matter asymmetry in the universe that can’t be explained by this model. “We can test this” next chapter. The process Pleier studies allows him to test whether the particle is doing its job as expected. In addition to analyzing data, Pleier also has “major responsibility in upgrading the detector,” said Hong Ma, a group leader in the Physics Department at BNL who recruited Pleier to join BNL in 2009. Scientists at the [Large] Hadron Collider in Switzerland and at BNL and elsewhere are studying interactions that are incredibly rare among particles. Pleier is searching for interactions of vector bosons, which have spin values of one and are extremely large in the world of bosons. He is looking for cases where two W bosons interact with each other. “Only one event out of a hundred trillion events will be of interest to me,” said Pleier. Comparing those numbers to the world of biology, Pleier likened that to finding a single cell in an entire human body. 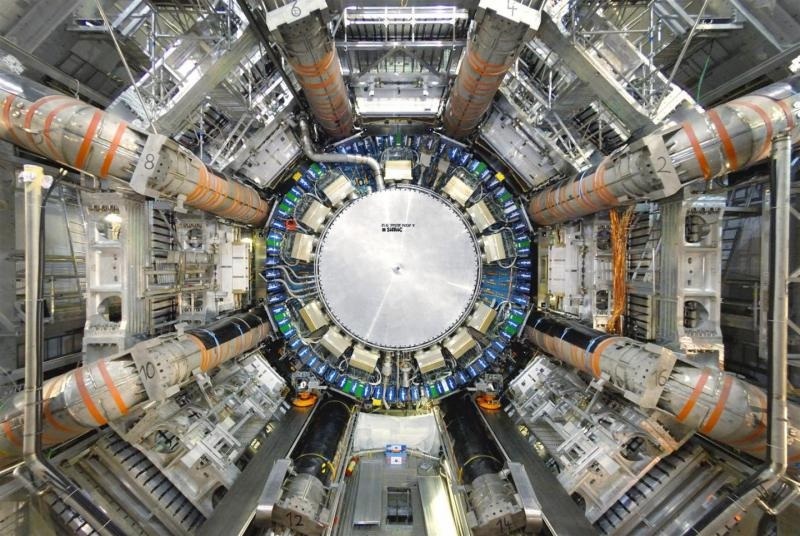 In 2012, the Hadron Collider produced 34 such interactions. The collider produces about 40 million pictures per second. To find the ones that might hold promising information, scientists like Pleier need to use a computing grid. BNL is one of only 10 tier 1 centers for ATLAS and the only one in the United States. Thus far, scientists have been able to look at these collisions from energies at 8 trillion electron volts. They hope to measure similar data at 13 trillion electron volts next year. Growing up in Germany, Pleier said he loved playing with Legos to see how things worked. He helped fix his own toys. When he was older, he worked to repair a motor bike his uncle had. A resident of Middle Island, Pleier lives with his wife Heather, an English teacher who is staying home for now to take care of their three children. Pleier and Ma emphasized that the work at the collider is a collaborative effort involving scientists from institutions around the world. Scientists running the ATLAS experiment at the Large Hadron Collider (LHC), the world’s largest and most powerful “atom smasher,” report the first evidence of a process that can be used to test the mechanism by which the recently discovered Higgs particle imparts mass to other fundamental particles. More rare than the production of the Higgs itself, this process—a scattering of two same-charged particles called W bosons off one another—also provides a new stringent test of the Standard Model of particle physics. The findings, which so far are in agreement with predictions of the Standard Model, are reported in a paper just accepted by Physical Review Letters. The analysis efforts started two years ago and were carried out in particular by groups from Brookhaven, Lawrence Berkeley National Laboratory, Michigan State University, and Technische Universität Dresden, Germany. Preliminary results were presented by Pleier at the “Rencontres de Moriond – QCD and High Energy Interactions” conference in March 2014. 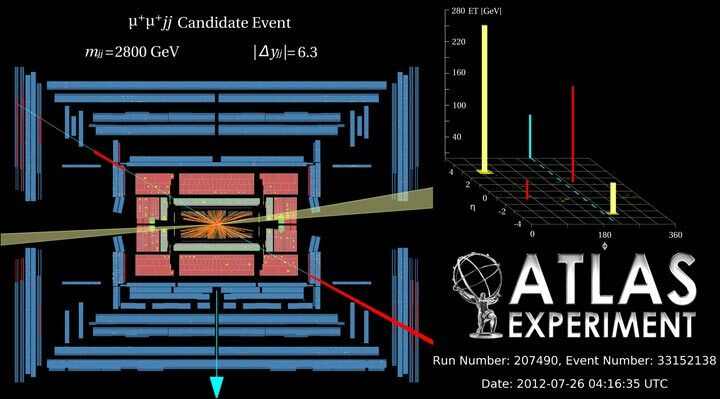 Now finalized based on a total of 34 observed events, the measured interaction rate is in good agreement with that predicted by the Standard Model, a theory describing all known fundamental particles and their interactions. “The Standard Model has so far survived all tests, but we know that it is incomplete because there are observations of dark matter, dark energy, and the antimatter/matter asymmetry in the universe that can’t be explained by the Standard Model,” Pleier said. So physicists are always looking for new ways to test the theory, to find where and how it might break down. Now with the LHC data in hand, the measured rate agrees with the prevailing theory’s predictions and establishes a signal at a significance level of 3.6 sigma—strong evidence, according to Pleier. “The probability for this measurement to be a mere background fluctuation is very small—about one in 6000,” he said. But the physicists would like to be more certain by collecting more data to reduce uncertainties and increase the level of significance. To test the Higgs mechanism, the scientists compare distributions of decay products of the W scattering process—how often they observe particular products at a particular energy and geometrical configuration. The LHC will resume data taking at increased collision energies—13 tera-electronvolts (TeV) instead of 8 TeV—in spring of 2015. The datasets collected will be up to 150 times the size of the currently available data and will allow for a detailed behind-the-scenes look at the Higgs at work. 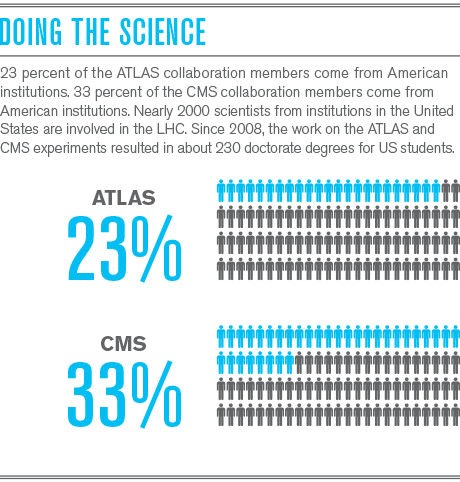 The ATLAS experiment at LHC is supported by DOE’s Office of Science and the National Science Foundation.